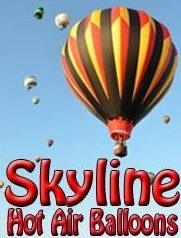 Skyline Hot Air Balloons flys in the foothills of the Blue Ridge Mountains, offering private balloon rides and balloon flight training. Private flights include only members of your party and the commercial pilot. Skyline Hot Air Balloons flys all year, when conditions are suitable, including an occasional "polar bear flight" for those who enjoy the winter months.